If you’re like me, you spend your days toggling back and forth between a dozen or so tabs crowding the top of your computer screen: One for e-mail, a few for social media, a few for news, one to monitor college basketball in anticipation of the NCAA tournament, and one for celebrity gossip for when you need a few minutes of junk-food reading to blow off steam. But Internet browsing doesn’t need to be that complicated, says Jordan Warzecha, co-founder and CEO of the Detroit-based startup Backstitch. Backstitch wants to ease the information overload users experience by allowing them to create a personalized home page. Once you sign up for a free Backstitch account, you can choose to add content from sources like Youtube, Twitter, Instagram, Facebook, CNN, the Onion, and ESPN. You can also add deal sites and even blogs. You can choose to follow Backstitch-selected topics such as Apple News or Marvel Universe, or you can create your own topics to follow. To personalize it further, you can create what Warzecha says are essentially search terms. Say you type in the word “Detroit.” Backstitch will then show you every Detroit-related article and social media post from the information sources you chose. And it’s all laid out in a clean, simple interface. It’s all a little reminiscent of a previous generation of personalized portal services or RSS aggregators such as My Yahoo and Netvibes, but Warzecha says those earlier services didn’t need to grapple with the massive influx of social media data that we have today. Backstitch, he says, goes out and indexes data on a deeper level, leading to a more personal and relevant experience. 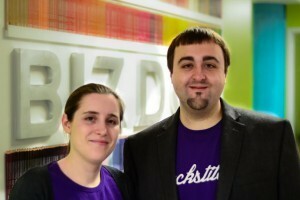 Warzecha launched Backstitch about a year ago with his wife Stefanie, who is also Backstitch’s COO. The pair met while attending Lake Superior State University in Michigan’s Upper Peninsula. After graduation, Warzecha was managing IT for Part D Advisors, helping municipalities figure out how to fund retiree health care, and his wife was writing software for Caterpillar. Warzecha realized the software he had built at work, with its layers of analytics and complex data crunching, might have an application in the world at large that was a little more fun and useful to the average Internet user. He and his wife decided to start their own company around that idea. After some positive early press in the tech media, Warzecha says investors began to reach out. According to VentureDeal, Backstitch has raised $100,000 so far in seed funding, and Warzecha says they’re currently raising another seed round. Backstitch is also starting to work with businesses and organizations that are interested in using the platform internally to monitor topics relevant to employees or its chosen industry, and then taking some of that information and repackaging it for customers. “A year from now, we hope to expand that offering,” Warzecha says. He envisions a premium, subscription-based version of Backstitch for businesses and organizations. “We have competitors on a few different points, whether it’s the search side or the content side, but nobody is doing everything that we’re doing,” he adds.